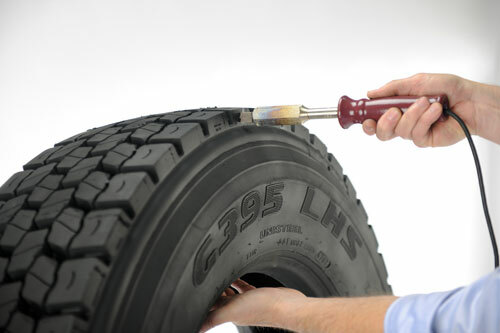 • Offering a quality, cost-effective alternative to new tires. • Meeting the premium retread specs of large national fleets by wheel position. • Providing popular on-highway sizes and treads coast to coast through FleetHQ dealers. To display authenticity, Gold Medallion retreads are branded with a “Gold” emblem on the side of the tread directly above the tire’s DOT number. Gold Medallion retreaded tires are available throughout the United States and Canada through the FleetHQ network of servicing dealers. Popular tread designs are available, including the Goodyear G305 AT LHD Fuel Max, G316 LHT Fuel Max and G182 RSD, and in these sizes: 295/75R22.5, 285/75R24.5, 275/80R22.5, 275/80R24.5, 11R22.5 and 11R24.5. The FleetHQ emergency road service program has no enrollment fees, no incidence fees for calling its toll free number (866-fleetHQ), and the price customers pay for tires on the road is the same as they pay at home. It offers a portfolio of business solutions that include online information systems providing 24/7 access to services in progress, retread history, repair data and tire purchase histories. To learn more about the program, or to find the nearest authorized dealer, go to www.fleetHQ.com .